I should have brought my camera...tonight I was the "feature" at a popular open stage in the East End at the Renaissance Café. When I saw the gig posted on the folk listserv they said there was going to be a TV crew there filming a "makeover" program for the Women's Television network. They were all over the club when I got there...lighting guys, camera guys, sound guys...hmmm...all guys. Anyway the open stage was proceeding with the regulars (a very high calber of talent) then it was time for thew "feature". I don't know why I'm putting quotes around feature...maybe I've never been a feature before...actually there was that time at the Liquid Lounge in Brantford. I shared the feature spot with Rod Phillips and we rocked. That was the day I got to play with Hubert Sumlin and he uttered that now oft-repeated quote "You got somethin...something goood." I should have stuck around to see how thing ended up, but I left as "Janis" was launchinmg into the second take of a long, slow original. If any of my blogfans has a TV and hears when this plays on TV...please let me know. Speaking of my album, today was another milestone. I finally handed-off the final "completion report" that is required to get the final payment for the FACTOR loan that we received to finish this project. FACTOR is a government programme up here in Canada that will loan you money to do a recording and will understand if you don't sell enough CD's to pay them back. But they make it pretty complicated...You need copies of the invoice, the cancelled cheque and a signed, witnessed, declaration from each musician and engineer that they actually received the money. Phew! I shouldn't be complaining so loud until after the cheque is in the mail. then I get a reality check from some bad reviews (I think the record company has been shielding me, but my friend Jacquie googled me and found them - hmmm, it takes a real secure friendship to get away with that). Some guy said the album should be called "Underqualified to Make a Decent Blues Album". Another guy knew that I had asked all the players to listen to John Hammond's "Wicked Grin" album before we started the sessions. How did he know that??? Anyway, drummer Michelle Josef was the only one who took my advice....and in the end we didn't really capture that sound - but then we created something all our own, thanks the engineer Paul Benedict who spent years and years doing live sound and has what they call "big ears"
On The Road Again! This is the first tour since the CD release and only the first of many, I hope. Startewd out at the OCFF (Ontario Council of Folk Festivals) Conference and Showcase in Kingston. I was very grateful to be invited by Magoo to be the "facilitator" for a campfire-style song circle. Man was I surprised when I got there (in the nick of time) - they had transformed a meeting room in a convention centre with a hi tech fireplace in the centre and subdued lighting all around. There really was a "getaway" vibe from the hustle and bustle of a music industry conference. The rest of the night was mostly jamming with musicians in the room. Lily Sazz had her piano, some guests were Suzie Vinnick and Ken Whiteley with his bass playing son, Jesse. I was so happy to have brought the bass along. I got to play a lot and so did many others. It's a beautiful old P-Bass that practically plays itself. I pulled out the bass at the gig I did in Pointe Claire with some great Montreal-based blues guitarists, Rob Macdonald, Dale Boyle and Vincent Beaulne. Promoter Brian Slack called it a "guitar summit" and it was a great show. I played a night in Belleville, too. That was in a nice little hall promoted by the Loyal Blues Fellowship of Belleville. The last gig was a taste of things to come...I hope. After the soundcheck (with a great PA and friendly, obliging sound man) its "will you have your dinner in the dressing room or would you like to eat in the club". And a cheese tray. A cheese tray! Mama, this is the big time!!! I hope I'll have the opportunity to thank you in person at the OCFF Conference. If you spot me before I spot you, please stop and say hello. I'll be hosting the "Campfire" on Saturday from 12:30-2:00pm and doing a Midnight solo set followed by an all-night jam in the blues room where Lily Sazz will have her keyboard and I will be bringing along my bass. The album is now available at amazon.com and individual tracks are now available on Itunes and we’re getting a lot of play including a syndicated Blues show in the states with 100 stations and an audience of over 2 million listeners. Lots of reviews, too: The Globe and Mail's Brad Wheeler had me at the top of his picks for September 30. He wrote: "On His new Overqualified For The Blues disc, the genial blues player does nothing like Born Under A Bad Sign. But for mature, relaxed-fit acoustic blues, Blain's the man for the job." “…a subtle, poignant, affecting album that initially confuses you; for the question here is; is it a folk influenced blues album, or a blues influenced folk album? … a distillation of life's experiences and frustrations including friendship, love, landmines, death, adoption and insensitive music executives, all presented with skill, love, care and conviction. A musical tapestry of styles and heartfelt emotions woven together with … an engaging feeling of warmth and comfort in sound, combined with a questioning stance on some social issues. An album to relax to and make you think! Mucho Impressto! “Canada has had its own version of the blues for some time now, and two new albums find themselves prominently at the forefront of this genre. The first is Brian Blain's Overqualified for the Blues, which on the title track tackles the obvious irony of the "blues" that proliferates from this land of the north: how do guys who've got money, are never abused, and have insurance, justify singing the blues? Throughout the album, Blain seeks to justify this. "Some say to get the blues you need to be low down livin' on welfare," he acknowledges on "High-Tech Blues", but as "my computer is crashing and my network's going down," he experiences the blues as well. "The high-tech blues strikes all, ask any millionaire," he adds. …A very interesting number is his blues song about the blues, "The Blues is Hurting". Funny no one's thought of doing this before, considering, as Blain points out, "My favourite club is closing, CD sales are down... the money hasn't changed in 30 years, and there's still clubs downtown expect the band to play for beers." Nonetheless, Blain claims to write "the kind of blues that lifts you up if you're feeling down." …It's strange, ironic, maybe even oxymoronic, but it's true. Very entertaining, groovy music and stories that hold your attention are some of the defining characteristics of this album. “Canadian based label Northern Blues Music's latest releases focus on a trio of Canadian roots and blues artists. The catalogue numbers suggest that Brian Blain's album has been in the pipeline for a while, and the liner notes confirm this: the first tracks were laid down just before Christmas 2002. …Blain is an astute observer of life and this is reflected in his lyrics which are shot through with a wry sense of humour. Few would be able to get away with the opener "Saab Story" which cleverly plays on the Saab/sob pun, but Blain pulls it off with consummate ease. Blain sings and plays guitar throughout, accompanied by a range of familiar names including Michael Jerome Brown, Harry Manx, Paul Reddick, and the rhythm section from Downchild. The musical quality, however, remains unfailingly high throughout, as Blain traverses the blues and roots landscape. The album has a light, relaxed feel to it, the main exceptions being the straighter blues tracks, such as the excellent Magic Sam influenced "Terrace Inn" which has more of a rocking groove. Every one of the tracks has a tale behind it, and they are all memorable in their own way. The closing track ("The Big Fire"), in particular, occupies a soft spot in Blain's heart. Every year he enters it into the "Songs From The Heart" contest, although he is still waiting to pick up first prize! …a real grower, and rewards the listener with repeated plays, and every track has something to recommend it. “Let's have a look at a new figure on the Canadian blues circuit. Brian Blain is a native of the eastern townships of Quebec. That's the portion of Quebec that borders on Vermont and New Hampshire. You're thinking to yourself that this isn't a likely setting for a bluesman. You're right! Brian Blain didn't begin with the blues but played everything from Bach to the Beatles. Music has been part of his life for forty of his sixty years. Like many others, Blain learned the blues from an old 1964 Folkways LP by Jerry Silverman The Art Of The Folk-Blues Guitar. He learned his craft very well and is now an accomplished guitarist. More importantly, Blain is a brilliant writer incorporating everyday experiences and situations into his lighthearted blues songs. Happily, the new CD Overqualified For The Blues is composed of a dozen original works and one cover tune. From the sentimental "Enfant Choisi" to the funny and topical "Hi-Tech Blues," the singer holds his listener's attention. Brian Blain moved to the Toronto area fifteen years ago and uses many of that city's top musicians on the new album. The backbone of the Downchild Blues Band backs Blain on "Hi-Tech Blues." The title tune "Overqualified for the Blues" features harp ace Paul Reddick and ex- Janis Joplin piano-man Richard Bell. Guitarist extraordinaire Harry Manx appears on Blain's politically oriented "Peace." 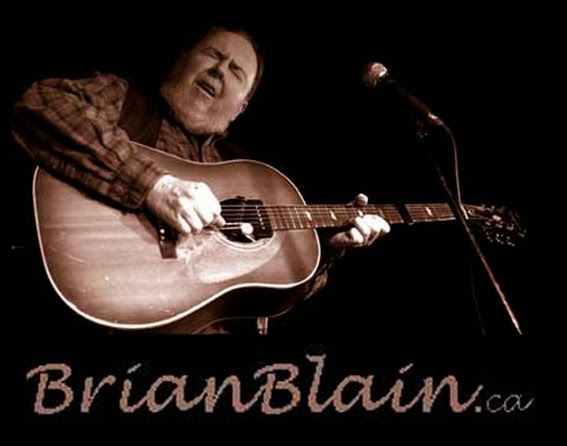 Brian Blain's CD is a portrait of a folk-blues artist having fun with his music. He pokes fun at the music industry and especially the press with "One More Weasel." Thanks Brian! His "Saab Story" tells the funny tale of a girl and her car. Blain's guitar artistry comes to the forefront on the beautiful "Sailing." This reviewer enjoyed the guitarist's cover of Betty James and Edward Johnson's "I'm A Little Mixed Up." Brian Blain could put a smile on a gargoyle.